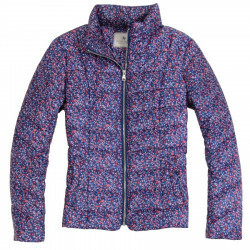 Light zipped padded jacket with liberty patterns, pleasant to wear with spring tones. Pleasant to wear, light, this flowery purple padded jacket is a spring summer reminder! This jacket is fitted with zip closure. Two side pockets and also one pocket inside. This jacket is very fitted, we advise you to choose one size larger than usual. Outside : 100 % polyester, inside and lining : 100 % polyester.